This print of Queen Charlotte includes a cherub above her head who carries a scroll inscribed Crown'd Sept. 22nd 1761. This print of Britannia with Minerva includes Holdship's anchor rebus as printer and the mark Derby. This important mug is in the Royal Crown Derby Museum. 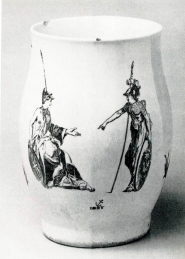 It was made to commemorate the coronation of George III and Queen Charlotte on the 22nd September 1761 and, as well as prints in black of their Majesties, it bears a print of Britannia and Minerva. The latter print is signed with an anchor (the rebus for Holdship) and the word DERBY. This would seem to indicate that Richard Holdship was at Derby earlier than 1764, the year in which he signed an agreement with William Duesbury and John Heath to show them how to make soaprock porcelain and to print for them in enamel or blue on their porcelain. 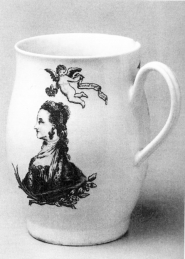 The print on this side of the mug shows an angel blowing a trumpet and placing a crown on the king's head.